"Paul is dead" is an urban legend and conspiracy theory alleging that Paul McCartney, of the English rock band the Beatles, died in November 1966 and was secretly replaced by a look-alike. In September 1969, a rumour of McCartney's supposed death began spreading across college campuses in the United States. The rumour was based on perceived clues found in Beatles songs and album covers. Clue-hunting proved infectious, and within a few weeks, had become an international phenomenon. 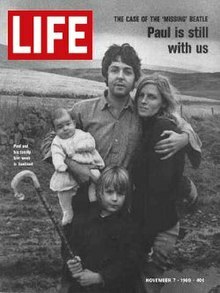 Rumours declined after a contemporary interview with McCartney, who had been secluded with his family in Scotland, was published in Life magazine in November 1969. During the 1970s, the phenomenon was the subject of analysis in the fields of sociology, psychology and communications. References to the legend are still occasionally made in popular culture. 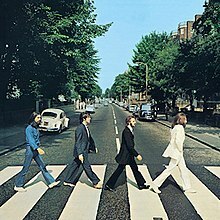 McCartney himself poked fun at it with his 1993 live album, titling it Paul Is Live, with cover art parodying clues allegedly placed on the cover of the Beatles' album Abbey Road. In 2009, Time magazine included "Paul is dead" in its feature on ten of "the world's most enduring conspiracy theories". The allegedly backmasked section of "Revolution 9"
The same section reversed, which some have believed sounds like "turn me on, dead man"
On 17 September 1969, Tim Harper, an editor of the Drake Times-Delphic, the student newspaper of Drake University in Des Moines, Iowa, published an article titled "Is Beatle Paul McCartney Dead?" The article addressed a rumour being circulated on campus that cited clues from recent Beatles albums, including a message interpreted as "Turn me on, dead man", heard when "Revolution 9" (from the White Album) is played backwards. According to music journalist Merrell Noden, this was the first published article on the "Paul is dead" theory. [nb 2] Harper later said that it had become the subject of discussion among students at the start of the new academic year, and he added: "A lot of us, because of Vietnam and the so-called Establishment, were ready, willing and able to believe just about any sort of conspiracy." On 10 October the Beatles' press officer, Derek Taylor, responded to the rumour, saying: "Recently we've been getting a flood of inquiries asking about reports that Paul is dead. We've been getting questions like that for years, of course, but in the past few weeks we've been getting them at the office and home night and day. I'm even getting telephone calls from disc jockeys and others in the United States." On 12 October 1969, a caller to Detroit radio station WKNR-FM told disc jockey Russ Gibb about the rumour and its clues. Gibb and other callers then discussed the rumour on air for the next hour, during which Gibb offered further potential clues. Two days later, The Michigan Daily published a satirical review of Abbey Road by University of Michigan student Fred LaBour, who had listened to the exchange on Gibb's show, under the headline "McCartney Dead; New Evidence Brought to Light". It identified various clues to McCartney's death on Beatles album covers, particularly on the Abbey Road sleeve. LaBour had invented many of the clues and was astonished when the story was picked up by newspapers across the United States. Noden writes that "Very soon, every college campus, every radio station, had a resident expert." WKNR fuelled the rumour further with its two-hour programme The Beatle Plot, which first aired on 19 October. The story was soon taken up by more mainstream radio stations in the New York area, WMCA and WABC. In the early hours of 21 October, WABC disc jockey Roby Yonge discussed the rumour on-air for over an hour before being pulled off the air for breaking format. At that time of night, WABC's signal covered a wide listening area and could be heard in 38 US states and, at times, in other countries. Although the Beatles' press office denied the rumour, McCartney's atypical withdrawal from public life contributed to its escalation. Vin Scelsa, a student broadcaster in 1969, later said that the escalation was indicative of the countercultural influence of Bob Dylan, the Beatles and the Rolling Stones, since: "Every song from them – starting about late 1966 – became a personal message, worthy of endless scrutiny ... they were guidelines on how to live your life." Before the end of October 1969, several record releases had exploited the phenomenon of McCartney's alleged demise. These included "The Ballad of Paul" by the Mystery Tour, "Brother Paul" by Billy Shears and the All Americans, and "So Long Paul" by Werbley Finster, a pseudonym for José Feliciano. Another song was Terry Knight's "Saint Paul", which had been a minor hit in June that year and was subsequently adopted by radio stations as a tribute to "the late Paul McCartney". [nb 4] In Canada, Polydor Records exploited the rumour in their artwork for Very Together, a repackaging of the Beatles' pre-fame recordings with Tony Sheridan, using a cover that showed four candles, one of which had just been snuffed out. Proponents of the theory maintained that, in November 1966, McCartney had an argument with his bandmates during a Beatles recording session and drove off angrily in his car, crashed, and was decapitated. To spare the public from grief, or simply as a joke, the surviving Beatles replaced him with the winner of a McCartney look-alike contest. This scenario was facilitated by the Beatles' recent retirement from live performance and by their choosing to present themselves with a new image for their next album, Sgt. Pepper's Lonely Hearts Club Band. In LaBour's telling, the stand-in was an "orphan from Edinburgh named William Campbell" whom the Beatles then trained to impersonate McCartney. Others contended that the man's name was William Shears Campbell, later abbreviated to Billy Shears, and the replacement was instigated by Britain's MI5 out of concern for the severe distress McCartney's death would cause the Beatles' audience. In this latter telling, the surviving Beatles were said to be wracked by guilt at their duplicity, and therefore left messages in their music and album artwork to communicate the truth to their fans. A DJ put all those signs together: Paul with no shoes [on the cover of Abbey Road] ... and the Volkswagen Beetle. Then there was Magical Mystery Tour, where we three had red roses and he had a black one. It was just madness ... There was no way we could prove he was alive. Dozens of supposed clues to McCartney's death have been identified by fans and followers of the legend. These include messages perceived when listening to songs being played backwards and symbolic interpretations of both lyrics and album cover imagery. One frequently cited example is the suggestion that the words "I buried Paul" are spoken by Lennon in the final section of the song "Strawberry Fields Forever", which the Beatles recorded in November and December 1966. Lennon later said that the words were actually "Cranberry sauce". Another example is the interpretation of the Abbey Road album cover as depicting a funeral procession. Lennon, dressed in white, is said to symbolise the heavenly figure; Starr, dressed in black, symbolises the undertaker; George Harrison, in denim, represents the gravedigger; and McCartney, barefoot and out of step with the others, symbolises the corpse. The number plate of the white Volkswagen Beetle in the photo was identified as further "evidence", the characters "28IF" representing McCartney's age "if" he had still been alive. [nb 5] That the left-handed McCartney holds a cigarette in his right hand was also said to support the idea that he was an imposter. McCartney was secretly filmed by a CBS News crew as he worked on his farm. As in his and Linda's segment in the Beatles' promotional clip for "Something", which the couple filmed privately around this time, McCartney was unshaven and unusually scruffy-looking in his appearance. His next visitors were a reporter and photographer from Life magazine. Irate at the intrusion, he swore at the pair, threw a bucket of water over them and was captured on film attempting to hit the photographer. Fearing that the photos would damage his image, McCartney then approached the pair and agreed to pose for a photo with his family and answer the reporter's questions, in exchange for the roll of film containing the offending pictures. In Winn's description, the family portrait used for Life's cover shows McCartney no longer "shabbily attired", but "clean-shaven and casually but smartly dressed". Perhaps the rumour started because I haven't been much in the press lately. I have done enough press for a lifetime, and I don't have anything to say these days. I am happy to be with my family and I will work when I work. I was switched on for ten years and I never switched off. Now I am switching off whenever I can. I would rather be a little less famous these days. In November 1969, Capitol Records sales managers reported a significant increase in sales of Beatles catalogue albums, attributed to the rumour. Rocco Catena, Capitol's vice-president of national merchandising, estimated that "this is going to be the biggest month in history in terms of Beatles sales". The rumour benefited the commercial performance of Abbey Road in the US, where it comfortably outsold all of the band's previous albums. Sgt. Pepper and Magical Mystery Tour, both of which had been off the charts since February, re-entered the Billboard Top LPs chart, peaking at number 101 and number 109, respectively. A television special dedicated to "Paul is dead" was broadcast on WOR in New York on 30 November. Set in a courtroom, it was hosted by the celebrity lawyer F. Lee Bailey, who cross-examined LaBour and other "witnesses", including McCartney's friend Peter Asher and Allen Klein, but he left it to the viewer to determine a conclusion. Before the recording, LaBour told Bailey that his article had been intended as a joke, to which Bailey sighed and replied, "Well, we have an hour of television to do; you're going to have to go along with this." It was a bit weird meeting people shortly after that, because they'd be looking at the back of my ears, looking a bit through me. And it was weird doing the "I really am him" stuff. McCartney returned to London in December. Bolstered by Linda's support, he began recording his debut solo album at his home in St John's Wood. Titled McCartney, and recorded without his bandmates' knowledge, it was "one of the best-kept secrets in rock history" until shortly before its release in April 1970, according to author Nicholas Schaffner, and led to the announcement of the Beatles' break-up. Both Lennon and McCartney subsequently referred to the "Paul is dead" legend in their solo careers. In his 1971 song "How Do You Sleep? ", in which he attacked McCartney's character, Lennon described the theorists as "freaks" who "were right when they said you was dead". McCartney titled his 1993 live album Paul Is Live and presented it in a sleeve that parodied the Abbey Road cover and its clues. LaBour later became notable as the bassist for the western swing group Riders in the Sky, which he cofounded in 1977. In 2008, he joked that his success as a musician had extended his fifteen minutes of fame for his part in the rumour to "seventeen minutes". In 2015, he told The Detroit News that he is still periodically contacted by conspiracy theorists who have attempted to present him with supposed new developments on the McCartney rumours. Author Peter Doggett writes that, while the theory behind "Paul is dead" defied logic, its popularity was understandable in a climate where citizens were faced with conspiracy theories insisting that the assassination of President John F. Kennedy in 1963 was in fact a coup d'état. Schaffner said that, given its origins as an item of gossip and intrigue generated by a select group in the "Beatles cult", "Paul is dead" serves as "a genuine folk tale of the mass communications era". He also described it as "the most monumental hoax since Orson Welles' War of the Worlds broadcast persuaded thousands of panicky New Jerseyites that Martian invaders were in the vicinity". In his book Revolution in the Head, Ian MacDonald says that the Beatles were partly responsible for the phenomenon due to their incorporation of "random lyrics and effects", particularly in the White Album track "Glass Onion" in which Lennon invited clue-hunting by including references to other Beatles songs. MacDonald groups it with the "psychic epidemics" that were encouraged by the rock audience's use of hallucinogenic drugs and which escalated with Charles Manson's homicidal interpretation of the White Album and Mark David Chapman's religion-motivated murder of Lennon in 1980. During the 1970s, the phenomenon became a topic of academic study in America in the fields of sociology, psychology and communications. Among sociological studies, Barbara Suczek recognised it as, in Schaffner's description, a contemporary reading of the "archetypal myth wherein the beautiful youth dies and is resurrected as a god". Psychologists Ralph Rosnow and Gary Fine attributed its popularity partly to the shared, vicarious experience of searching for clues without consequence for the participants. They also said that for a generation distrustful of the media following the Warren Commission's report, it was able to thrive amid a climate informed by "The credibility gap of Lyndon Johnson's presidency, the widely circulated rumors after the Martin Luther King, Jr. and Robert F. Kennedy assassinations, as well as attacks on the leading media sources by the yippies and Spiro Agnew". American social critic Camille Paglia locates the "Paul is dead" phenomenon to the Ancient Greek tradition symbolised by Adonis and Antinous, as represented in the cult of rock music's "pretty, long-haired boys who mesmerize both sexes", and she adds: "It's no coincidence that it was Paul McCartney, the 'cutest' and most girlish of the Beatles, who inspired a false rumor that swept the world in 1969 that he was dead." Similar rumours concerning other celebrities have been circulated, including the unsubstantiated allegation that Canadian singer Avril Lavigne died in 2003 and was replaced by a person named Melissa Vandella. In an article on the latter phenomenon, The Guardian described the 1969 McCartney hoax as "Possibly the best known example" of a celebrity being the focus of "a (completely unverified) cloning conspiracy theory". 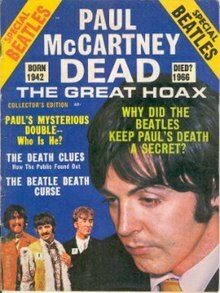 In 2009, Time magazine included "Paul is dead" in its feature on ten of "the world's most enduring conspiracy theories". There have been many references to the legend in popular culture, including the following examples. In the Rutles' 1978 television film satirising the Beatles' history, All You Need Is Cash, the identity of the alleged dead band member was transferred to the George Harrison character, "Stig O'Hara". As narrated by Eric Idle, the rumour was attributed to Stig's reluctance to be in the limelight and the fact that "he'd not said a word since 1966." The "Stig is dead" theory contended that the Rutles' guitarist "[had] been killed in a flash fire at a water bed shop and replaced by a plastic and wax replica from Madame Tussauds". In 2010, American author Alan Goldsher published the mashup novel Paul Is Undead: The British Zombie Invasion, which depicts all of the Beatles as zombies except Ringo Starr. In 2015, the indie rock band EL VY released a song called "Paul Is Alive", which contains lyrics referencing Beatlemania and partly addresses the 1969 rumour. In C.C. Benison's 2018 psychological thriller Paul Is Dead: A Novel, the protagonists are initially haunted by the 1969 conspiracy as they endure the aftermath of a crime. In 2018, Paul Is Dead, a comedy short film inspired by the conspiracy theory, was released. The film depicts a version of events where McCartney dies during a musical retreat and is replaced by a look-alike named Billy Shears. ^ McCartney was in London until 22 October when he flew to Scotland with his family. ^ Writing in 1977, author Nicholas Schaffner said that the theory "has been traced variously to an Ohio Wesleyan University student's thesis and to a prankish article in an Illinois University student newspaper". ^ Estranged from McCartney, Lennon said: "Paul McCartney couldn't die without the world knowing it. The same as he couldn't get married ... [or] go on holiday without the world knowing it. It's just insanity – but it's a great plug for Abbey Road." ^ A Capitol Records recording artist, Knight had been present during the White Album session when Starr temporarily left the band, in August 1968. In the song, the singer conveys his fears that the Beatles were about to disband. ^ The fact that he would have been 27 in late 1969, rather than 28, was dismissed with the rationale that, in the Hindu tradition, infants were one year old at birth. ^ In the 2000 book The Beatles Anthology, McCartney says that his reaction to the rumour's growth had been: "Well, we'd better play it for all it's worth. It's publicity, isn't it?" ^ In his article on the legacy of "Paul is dead", for Dawn in January 2017, Anis Shivani wrote that the narrative has grown, in the manner of JFK's assassination, to incorporate related conspiracy theories. In this expanded narrative, Lennon's murder in 1980, Harrison's near-fatal stabbing in 1999, and the death of Beatles associate Mal Evans in 1976 are all credited to forces protecting the "truth" behind "Paul is dead". ^ a b Yoakum, Jim (May–June 2000). "The Man Who Killed Paul McCartney". Gadfly Online. Retrieved 27 September 2018. ^ "Beatle News". The Beatles Book. February 1967. ^ Moriarty, Brian (1999). "Who Buried Paul?". ludix.com. Retrieved 27 September 2018. ^ Miles 2001, pp. 353, 354. ^ Sounes 2010, pp. 261, 263–64. ^ Rodriguez 2010, pp. 1, 396, 398. ^ "Paul McCartney Arrives In Scotland In Good Health". Freeport Journal-Standard. Freeport, Illinois. 24 October 1969. McCartney, his wife and their two children were seen and photographed at Glasgow Airport when they arrived from London Wednesday night. The millionaire pop music star told newsmen he and his wife were going for a two-week holiday on a farm near Campbelltown. ^ Schmidt, Bart (18 September 2009). "It Was 40 Years Ago, Yesterday ..." Drake University: Cowles Library blog. Retrieved 19 September 2010. ^ a b c d e f g h i j Noden, Merrell (2003). "Dead Man Walking". Mojo Special Limited Edition: 1000 Days of Revolution (The Beatles' Final Years – Jan 1, 1968 to Sept 27, 1970). London: Emap. p. 114. ^ a b c d e Schaffner 1978, p. 128. ^ "Paul McCartney Asserts He's 'Alive and Well'". Courier-Post. Camden, New Jersey. 10 October 1969. ^ "Beatle Paul McCartney Is Really Alive". Lodi News-Sentinel. UPI. 11 October 1969. p. 5. ^ Morris, Julie (23 October 1969). "The Beatle Paul Mystery – As Big as Rock Music Itself". Detroit Free Press. p. 6. ^ Winn 2009, p. 241. ^ a b LaBour, Fred (14 October 1969). "McCartney Dead; New Evidence Brought to Light". The Michigan Daily. p. 2. ^ a b c d Glenn, Allen (11 November 2009). "Paul Is Dead (Said Fred)". Michigan Today. Archived from the original on 28 December 2010. ^ a b c d e f g h i Schaffner 1978, p. 127. ^ "Why Did WABC Have Such a Great Signal?". Musicradio 77 WABC. Retrieved 5 August 2007. ^ a b Sounes 2010, p. 262. ^ a b c Winn 2009, p. 333. ^ a b c d The Beatles 2000, p. 342. ^ Neely, Tim (2006). Goldmine Standard Catalog of American Records 1950–1975. pp. 404, 863, 1078. ^ Billboard staff (8 November 1969). "McCartney 'Death' Gets 'Disk Coverage' Dearth". Billboard. p. 3. ^ a b c "Terry Knight Speaks". Blogcritics. 2 March 2004. Archived from the original on 25 October 2011. ^ MacDonald 1998, p. 271. ^ Schaffner 1978, p. 130. ^ Hoffmann & Bailey 1990, pp. 165–66. ^ Gould 2007, p. 593. ^ a b c d Turner 2016, p. 368. ^ a b c d Shivani, Anis (15 January 2017). "Paul is Dead: The Conspiracy Theory That Won't Go Away". Dawn. Retrieved 28 September 2018. ^ a b Time staff (July 2009). "Separating Fact from Fiction: Paul Is Dead". Time. Retrieved 28 September 2018. ^ Patterson, R. Gary (1996). The Walrus Was Paul: The Great Beatle Death Clues. New York: Simon & Schuster. p. 193–197. ISBN 0-684-85062-1. ^ MacDonald 1998, p. 273fn. ^ Yorke, Ritchie (7 February 1970). "A Private Talk With John". Rolling Stone. p. 22. ^ The Beatles 2000, pp. 341, 342. ^ "Beatle Spokesman Calls Rumor of McCartney's Death 'Rubbish'". The New York Times. 22 October 1969. p. 8. ^ Phillips, B.J. (22 October 1969). "McCartney 'Death' Rumors". The Washington Post. p. B1. ^ Miles 2001, p. 358. ^ a b c Winn 2009, p. 334. ^ Miles 2001, p. 359. ^ a b c Winn 2009, p. 335. ^ Sounes 2010, pp. 262–63. ^ Neary, John (7 November 1969). "The Magical McCartney Mystery". Life. pp. 103–06. ^ Burks, John (29 November 1969). "A Pile of Money on Paul's 'Death'". Rolling Stone. pp. 6, 10. ^ Schaffner 1978, pp. 126–27. ^ "Billboard Top LP's". Billboard. 3 January 1970. pp. 44–45. ^ Sounes 2010, p. 264. ^ Doggett 2011, pp. 111, 121. ^ Rodriguez 2010, p. 2. ^ Schaffner 1978, p. 135. ^ Rodriguez 2010, p. 399. ^ Sounes 2010, p. 290. ^ Doggett 2011, p. 339. ^ LaBour, Fred (1 August 2008). "True Westerners: Fred Labour – Too Slim of Riders in the Sky". True West Magazine. Retrieved 28 June 2016. ^ Rubin, Neal (10 September 2015). "Paul McCartney still isn't dead. Neither is the story". The Detroit News. Retrieved 27 June 2016. ^ Doggett 2011, p. 107. ^ MacDonald 1998, pp. 16, 273–75. ^ MacDonald 1998, pp. 273–75. ^ Schaffner 1978, pp. 128–29. ^ Paglia, Camille (Winter 2003). "Cults and Cosmic Consciousness: Religious Vision in the American 1960s". Arion: A Journal of Humanities and the Classics. 3rd. 10 (3): 61–62. ^ a b Cresci, Elena (16 May 2017). "Why fans think Avril Lavigne died and was replaced by a clone named Melissa". guardian.co.uk. Retrieved 1 October 2018. ^ Estatie, Lamia (15 May 2017). "The Avril Lavigne conspiracy theory returns". bbc.co.uk. Retrieved 1 October 2018. ^ Flood, Alison (31 July 2009). "The Beatles flesh out zombie mash-up craze". The Guardian. Retrieved 10 January 2016. ^ Van Nguyen, Dean (7 October 2015). "EL VY post lyric video for new single 'Paul Is Alive'". nme.com. Retrieved 24 July 2017. ^ WCYT staff (16 November 2015). "EL VY – 'Return to the Moon'". wcyt.org. Retrieved 30 September 2018. ^ "Paul Is Dead ... A Comedy Short Film Inspired By The Classic Bizarre Rock & Roll Conspiracy Theory". urbanistamagazine.uk. 30 September 2018. Retrieved 5 February 2019. Hoffmann, Frank W.; Bailey, William G. (1990). Arts & Entertainment Fads. Binghamton, NY: The Haworth Press. ISBN 0-86656-881-6.